Since George Washington’s first appointment, 112 people have served on the highest court in the land. Following the death of Antonin Scalia in 2016, that number will soon rise to 113. Donald Trump just nominated Neil Gorsuch, a 49-year-old federal judge from Colorado, for the appointment. So what will happen next? 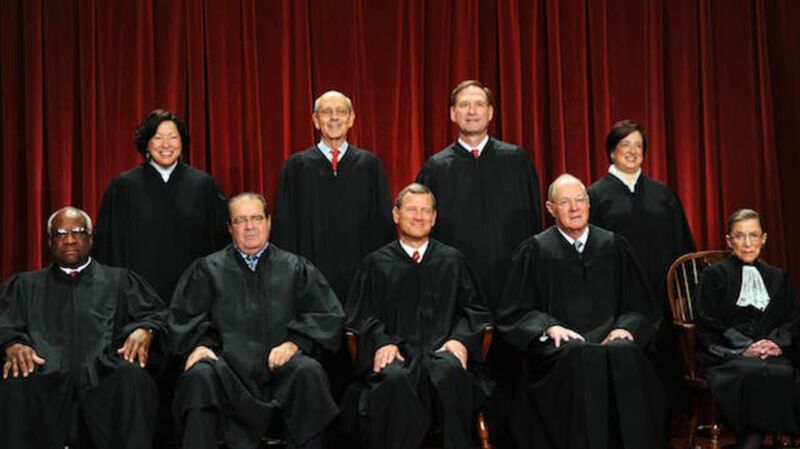 Unlike presidents, senators, and representatives, there are no requirements for Supreme Court Justices. The founders decided against having the people or just one branch of government select them because, as James Madison wrote in The Federalist Papers, justices needed to possess “peculiar qualities.” (In the same text, Madison explains why the appointments are for life, saying “the permanent tenure by which the appointments are held in that department, must soon destroy all sense of dependence on the authority conferring them.”) Justices can be young (Joseph Story was 32 when he became a justice in 1811), old (Horace Harmon Lurton was 65) or even foreign born (six justices were, most recently Felix Frankfurter, who was born in Vienna). While every Supreme Court Justice has had a law background in some form or another, that’s not a requirement either. According to the Supreme Court’s website, James Byrnes (who was appointed 1941) didn’t even graduate high school. He was entirely self-taught in law before passing the bar at 23. But going to an Ivy League school certainly helps. Of the eight current Supreme Court Justices, four went to Harvard, three went to Yale, and one went to Columbia (Scalia was also a graduate of Harvard). Justices can also be retired justices. This has happened twice, once with John Rutledge (more on him in a second) and again with Charles Evans Hughes. Hughes was appointed to the Supreme Court by William Howard Taft and in 1916 resigned so that he could run as the Republican candidate against Woodrow Wilson. After losing, Hughes performed a series of jobs in politics until Herbert Hoover appointed him Chief Justice to replace the same Taft that appointed him in the first place. That means that a president would be within precedent to re-nominate a former Supreme Court Justice. HOW WILL THE NOMINATION HAPPEN? The process is relatively straightforward. The president picks a suitable candidate, and that candidate is sent a questionnaire that touches on almost every aspect of their lives. After that, there’s a hearing before the Judiciary Committee (which at the moment is comprised of nine Democrats and 11 Republicans, including Presidential candidate Ted Cruz and former candidate Lindsey Graham), which is followed by more written questions. After all of the questions are answered, the Committee votes on whether to send the nomination to the full Senate with a favorable recommendation, an unfavorable recommendation, or no recommendation at all. As can be imagined, this has recently been partisan. Obama’s current two Justices, Elena Kagan and Sonia Sotomayor, both received near-party line votes, with Lindsey Graham breaking ranks both times. Bush’s pick of Samuel Alito was similarly split. The last person to survive this process with a unanimous vote was Stephen Breyer in 1994. The most brutal nomination was probably Robert Bork’s. Bork was picked by Ronald Reagan to be a new Justice. Immediately upon his announcement, the Democrat-controlled Senate pounced. Less than an hour after the announcement, Ted Kennedy delivered a speech where he said that, “Robert Bork's America is a land in which women would be forced into back-alley abortions, blacks would sit at segregated lunch counters, rogue police could break down citizens' doors in midnight raids, schoolchildren could not be taught about evolution, writers and artists would be censored at the whim of government, and the doors of federal courts would be shut on the fingers of millions of citizens for whom the judiciary is often the only protector of the individual rights that are at the heart of our democracy.” Almost everyone agrees that Kennedy was being extremely hyperbolic, but after awkward questioning (when asked why he wanted to be an Associate Justice, Bork’s response was “it would be an intellectual feast”), the Judiciary Committee voted 9-5 on largely party lines to send the nomination to the full Senate with an unfavorable recommendation (then-Republican Arlen Specter joined the Democrats in the unfavorable camp). After the nominee makes it through that process, the vote goes to the full Senate, where a simple majority is needed. But that can take a long time. Louis Brandeis, put forward on January 28, 1916, did not receive a final vote until June 1st, 125 days later [PDF]. It could have been worse: After Henry Baldwin died in 1844, President Tyler attempted to nominate a replacement. He tried putting up Edward King, which got postponed. So he tried Edward King again, and that time the nomination was withdrawn. Tyler then sent up John Read; the Senate just ignored him. That was it for Tyler’s presidency, so it was Polk’s turn. He first tried George Woodward, who was rejected 29-20. Polk tried again with Robert Grier, and over two years after Baldwin died, his seat was finally filled again. Tyler had similar (bad) luck filling Smith Thompson’s seat. All told, Tyler would nominate six different people a grand total of nine times and managed one confirmation; which ties him with FDR as the president with the second most nominations to the Supreme Court after Washington. WHAT IF THE SENATE’S NOT IN SESSION? The Constitution gives the President the “Power to fill up all Vacancies that may happen during the Recess of the Senate.” But the appointment expires at the end of the next session. So while the President can make an appointment, it’s only temporary; the Senate needs to vote on the candidate one way or the other. It’s a power that has been used 15 times, including with John Rutledge. John Rutledge, in return for his role in drafting the Constitution, was nominated and confirmed as the Court’s first senior associate justice. But he never went to any of the meetings and soon resigned to go to a lower court in South Carolina. In 1795, the first Chief Justice, John Jay, was set to retire, and Washington returned to Rutledge. At the time however, the Senate was in recess—which wasn’t a problem, as long as they confirmed him before the end of the next legislative session. But in between being appointed and getting confirmed, Rutledge spoke out against Jay’s Treaty, which was a recent treaty between the United States and Great Britain that had the support of Washington himself. Rutledge was accused of mental incapacity and when the confirmation vote came, Rutledge became the only recess appointment ever rejected. This case set the important precedent that the Justice’s political views were fair game in any nomination hearing and showed that recess appointments can be temporary.